Doniel Sutton makes her way to a few locations around the Golden State, pausing occasionally for a photo or two showcasing her latest fashion inspirations. With a bright and vibrant California landscape serving as her backdrop, Sutton shares that fashion has always been a passion of hers, but for reasons that may not be obvious. When she’s not creating content for her fashion blog about her latest inspirations, Sutton can be found at PayPal’s headquarters in Silicon Valley. In addition to being named one of Savoy Magazine’s Top Influential Women in Corporate America in 2016, Sutton was most recently recognized with a Bronze Stevie Award for Human Resources Executive of the Year. And she was honored as one of Black Enterprise’s most powerful executives in corporate America. Just as life imitates art, the way Sutton describes her passion for fashion is the same emotion she uses when describing her leadership approach as PayPal’s senior vice president of people. Now, Sutton is introducing a new style of HR innovation at PayPal that is turning heads in Silicon Valley and across the business world with a hands-on strategic approach that focuses on creating a culture of caring for all employees. Those core values not only make up the framework of PayPal’s culture, but they’re also key elements in Sutton’s HR strategy and initiatives that all relate to doing what’s best for people. Now, that compassion and insight have formulated into an innovative HR plan for PayPal that is making it even more of a destination workplace for today’s best and brightest. Actively seeking diversity of thought and valuing uniqueness is especially important to the culture of PayPal, and Sutton has made it a priority for employees to actively understand one another. As a result, Sutton and her team launched the conscious inclusion initiative. Over the years, Sutton and PayPal’s leadership team have committed to building a global team of employees that reflect the communities where they work and live, as well as the diversity of the customers the company serves. PayPal encompasses nearly twenty thousand employees in more than fifty offices around the globe, which means collaboration and incorporating an agile workforce are necessities for how individuals are assembled to execute on strategy. Because of PayPal’s numerous acquisitions as well, inspiring an agile workforce that can respond to change in a timely manner is key. Sutton says there is still work to be done in this area across the people organization and for PayPal overall. But the company is heading in the right direction, which in turn has provided more high-quality experiences for employees, as well as the company’s customers. One of the greatest strides Sutton has made at PayPal when it comes to HR initiatives comes from the use of data and analytics. Once a manual process, new automated workforce insights tools have allowed data far beyond gathering head count. Now, Sutton and the leadership team capture a wide array of employee data through their insights platform and other HR channels. As a result, there is now an opportunity to turn that data into actionable insights, Sutton explains. For example, the PayPal data analytics team developed a model to predict and identify potential retention risks by leveraging data across compensation, performance, and operations. Sutton has launched several programs to support employees when it comes to their health and wellness, all of which revolve around the desire to live by the company’s values that are woven into all of PayPal’s endeavors. Starting in 2018, PayPal began offering assistance to employees who face catastrophic events, such as natural disasters or personal tragedies. It is not a loan, and employees can apply for funding to help make the process of rebuilding as painless and as quick as possible. Since its launch, hundreds of thousands of dollars have been requested. PayPal has also extended paid bereavement time from five days to twenty days for employees who lose their domestic partner, spouse, or child. Sutton praises PayPal’s leadership team, as she says these decisions came about organically as a result of wanting to improve the lives of employees. Sutton and her team also introduced on-site childcare or reimbursement for off-site care for parents in PayPal’s India office. “This is a great way to encourage that morale and collaboration, and it really reinforces the core values,” she says. Despite the recognition Sutton has received for these initiatives, she will be the first to credit her team, and just like the intricate threads of high fashion, nothing can come together successfully without collaboration top-of-mind. 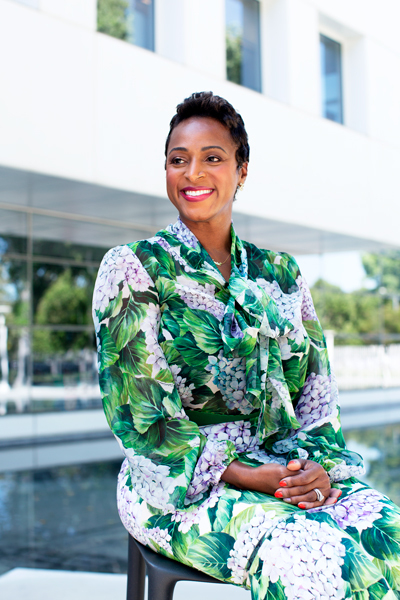 And just as she inspires everyone with fashion to see themselves at their best and embracing their own unique style, she brings that same mind-set to her role at PayPal. Right Management, a Talent Development partner of PayPal’s for 12 years, is pleased to recognize the accomplishments of Doniel Sutton, PayPal’s SVP of People. Doniel’s People team is focused on driving forward a culture of collaboration, innovation, wellness and inclusion. Right Management is honored to be a part of these efforts through delivery of our Emerging Leaders Program, an 8 week leadership development experience that includes assessments, coaching, and executive involvement. We look forward to continuing our work with Doniel and her team as they leverage talent development to inspire an engaged, productive and loyal workforce. Learn more at www.right.com.